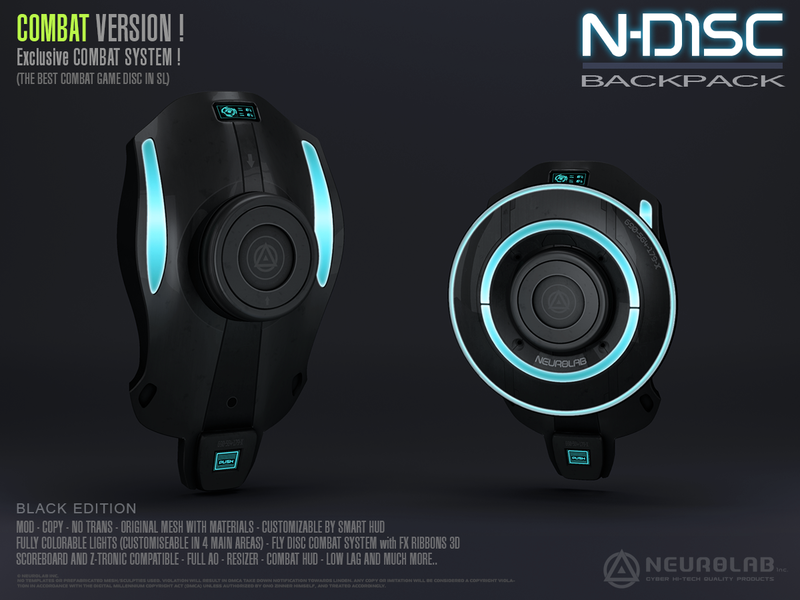 Neurolab is proud to present to you the new N-Disc COMBAT BackPack. FIGHT WHERE YOU WANT WITH OTHER N-DISC COMBAT USERS OR FIGHT WITH OUR DISC ARENA. You can also use it in the Battle Arena with Z-Tronic Combat Bike for Bike+Disc battle action. • FULL COMPATIBLE WITH SCOREBOARD + RESPAWN SYSTEM + BATTLELOG ONLINE ! • FULL COMPATIBLE WITH Z-TRONIC BIKE COMBAT. • High Quality Luxury Mesh, Ultra realistic Materials textures with shadows. 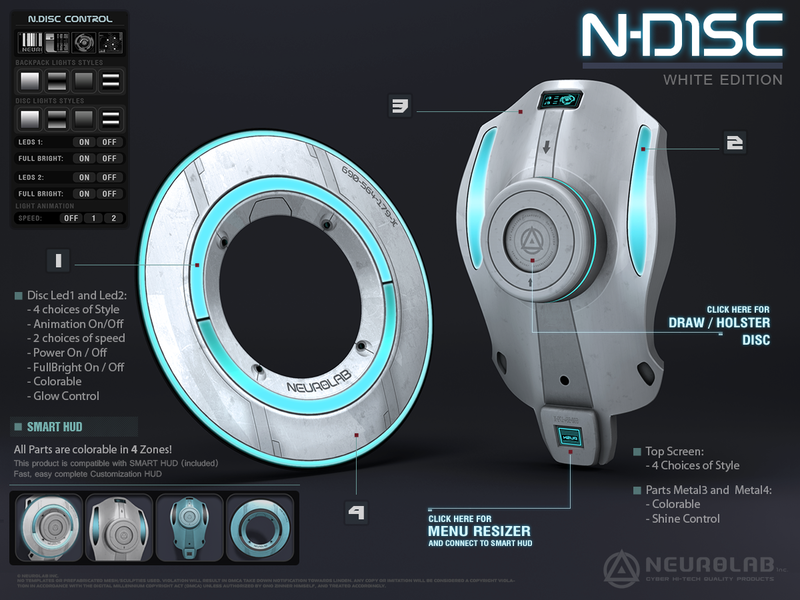 • EXCLUSIVE COMBAT SYSTEM (throw and melee) GREAT FOR ROLEPLAY ! • EXCLUSIVE AND REALISTIC SOUND EFFECTS! • NO LAG! Professional Script memory optimization for best performance! • FREE UPDATES FOR LIFE! • You can customize the Colors independently of 4 Parts by choosing your color, glow and shine for each part or all your Set products. • Unlimited Colors, 16 Presets, Option Product. • Synchronize all your outfits together with a few clicks. • Selectors by ITEM, SET or ALL (10 m, 20 m, 100 m). • Access to advanced options for each products. 2. 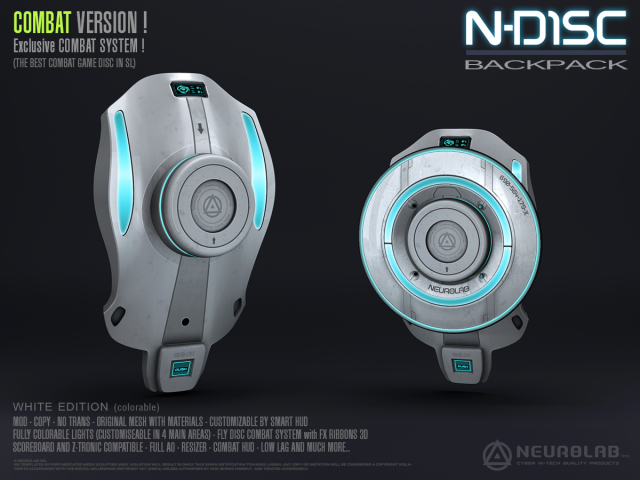 Wear the items : backpack + N.Disc Hand + Combat Hud. 4. Right click to your backpack and Use Edit then Move to adjust on your avatar, same for disc hand..
– IF you have the two products ( Z-Tronic Bike Combat & N-Disc Combat) or if you play with your bike and backpack at the same time, always use your Z-Tronic HUD Driving (Owner). Was also incorporates the two modes of fighting and automatically switches the display when you fight! 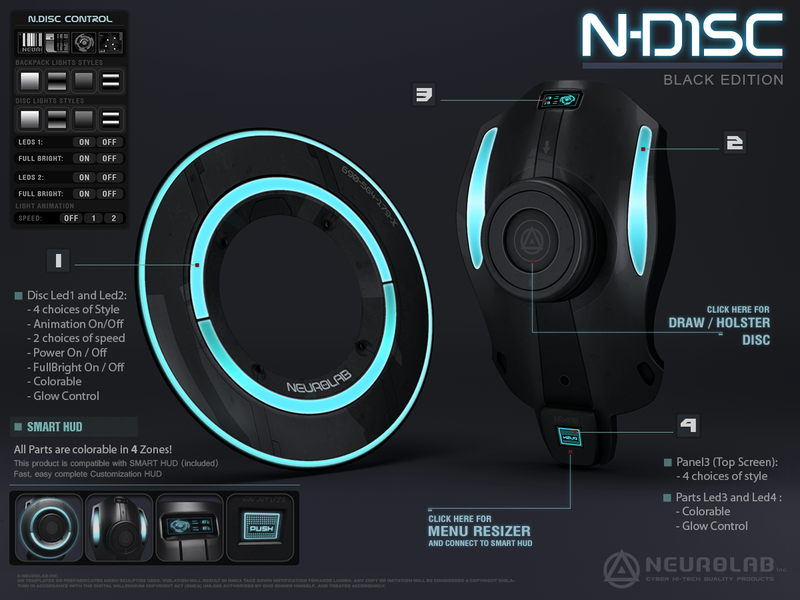 – To Draw/Holster the disc in your hand, click on your Ndisc center to backpack. – Combat work only on Sim with REZ permission !!! – Respawn System work only on Sim with Tp allowed !!! 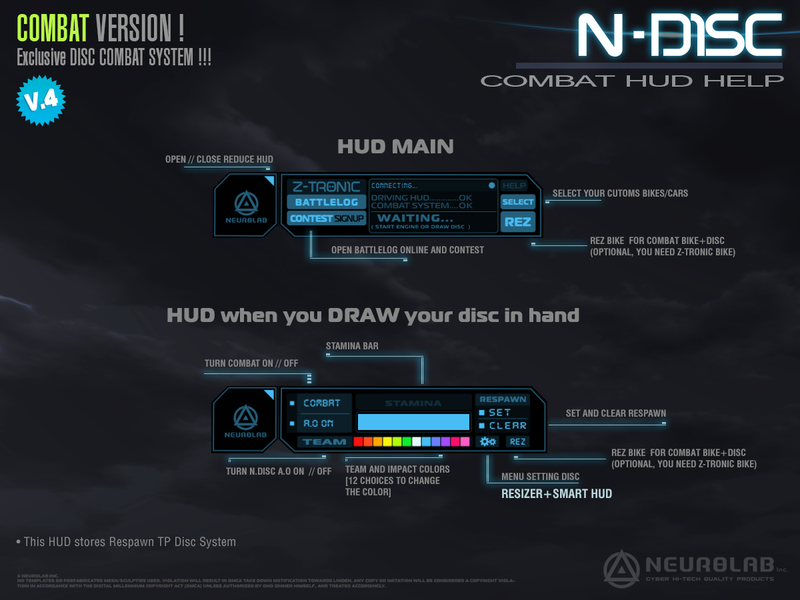 ➜ Ribbon Color is synchronized with the color of your Ndisc. The shots take some time to be really focused, before this time they can be interrupted by the attack of another player. Some shots are faster but do less damage. Some moves use energy (Stamina) to be executed. The Stamina recharges itself with time. Once the disc holster can be launched with a left click. Hold down the left mouse button activates the attack mode. In attack mode it is impossible to move. Hold the down arrow key ↓ engage the protection mode, take care, about the hits (or disks launched) from the back, they will not be blocked. Clear = Clear this resurrection spot, you will not be teleported when you die, unless you play with a scoreboard that has its own resurrection points. � If you have any questions, suggest or others , send me a notecard to “Ono Zinner”. � Technical Support: Contact “Rohacan Hirons” by Notecard. – Join the customer group Neurolab Inc. to be informed of the updates, latest creations, events, promo and benefit from our exclusive sales!